•	C-MORE-C offers fast absorption of Calcium in blood. •	C-MORE-C offers advantage of 250mg elemental calcium tablets for treatment of Osteoporosis & associated fractures. •	C-MORE-C offers Vitamin D3 required in order to utilize Calcium to make bone matrix healthy and for proper Bone Mineralization •	C-MORE-C will not only ensure Calcium absorption but will also ensure proper utilization of Calcium. 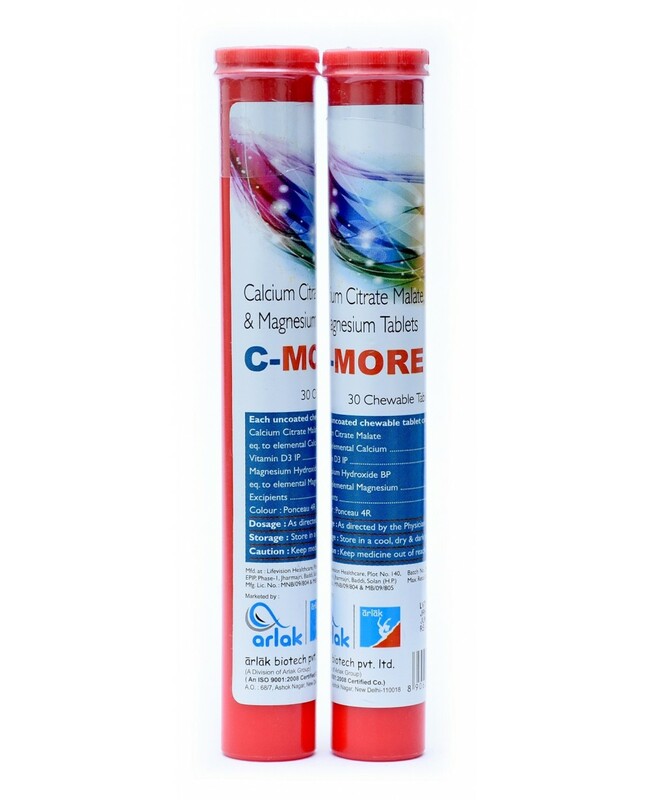 •	C-MORE-C facilitates the calcium retention and promoting the bone mass. •	C-MORE-C increases absorption of calcium and phosphorus required for strong bones. MAGNESIUM 50 MG Magnesium supports the health of the heart and nervous system, as well as relaxation of muscles. Magnesium is also the main ingredient in many antacids and laxatives. Magnesium is required for energy production, oxidative phosphorylation, and glycolysis. It contributes to the structural development of bone and is required for the synthesis of DNA, RNA, and the antioxidant glutathione. Magnesium also plays a role in the active transport of calcium and potassium ions across cell membranes, a process that is important to nerve impulse conduction, muscle contraction, and normal heart rhythm. Magnesium plays a role in reducing high blood pressure and supports the production of intracellular enzymes necessary for energy production, DNA replication, hormone production, body growth and cellular repair and maintenance. CALCIUM CITRATE MALATE 250 MG Calcium plays a very important role in the body. It is necessary for normal functioning of nerves, cells, muscles, and bones. If there is not enough calcium in the blood, then the body will take calcium from bones, thereby weakening bones. Calcium is necessary for proper teeth/bone development and muscle function. VITAMIN D3 400 I.U. Vitamin D helps your body absorb calcium and phosphorus. Having the right amounts of vitamin D, calcium, and phosphorus is important for building and keeping strong bones. Adequate vitamin D intake is important for the regulation of calcium and phosphorus absorption, maintenance of healthy bones and teeth, and is suggested to supply a protective effect against multiple diseases and conditions such as cancer, type 1diabetes and multiple sclerosis. This essential mineral also helps to strengthen the immune system and promotes healthy muscle function, while there is evidence from large-scale clinical trials to suggest that vitamin D may help to reduce the risk of dementia. Furthermore, it may modify immune function, cell proliferation, differentiation and apoptosis. Delivering vitamin D supplements to homebound seniors might help lower their risk of falls. Vitamin D plays an important role in maintaining muscle strength.